We have all sat through mind-numbingly bad PowerPoint presentations more times than we’d like to remember. But when it comes time to prepare our own PowerPoint presentations, we don’t know what to change to make ours better. We all wind up following the same mind-numbing model. Here’s how to make your PowerPoint presentations subtly stand out from the crowd so everyone will know yours was the best, but not exactly why. You want the presentation to depend on you–you have to be there, you have to say words out loud. Otherwise, why do a presentation at all? You could just send a textual memo by email. Don’t use PowerPoint as a substitute for or repetition of your presentation. Use it for visual support with minimal text that simply re-inforces what you are saying in your presentation. Which brings us to…. #2 Open the slide with an assertion in the form of a complete sentence. #3 Provide visual support for your assertion. This should be photos, graphs, tables, charts–something visually appealing that is directly related to your assertion. Don’t use clip art or other generic, cheesy images. If you don’t need visual support for your presentation, then don’t use PowerPoint at all. #4 Present to your audience new information that they don’t already have. Part of the reason most PowerPoint presentations are so mind-numbing is that people use it to cover stuff that the entire audience already knows themsevles. Or they read out loud to you from text-filled slides. Instead, try to provide examples, applications, or illustrations of the content everyone has already covered. Then you are presenting something new while connecting it to the content everyone already covered. 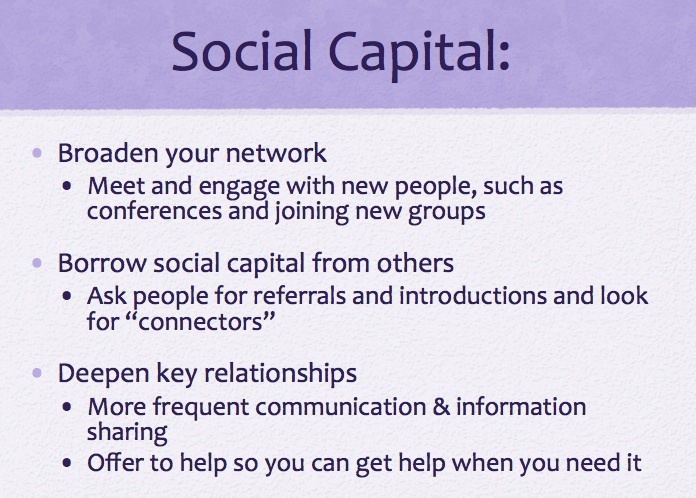 Note the assertive statement telling you what “social capital” is. It is immediately followed by a visual example (not stunning, but it gets the job done for this context.) Then the audience is asked a follow-up question. It has a title + colon heading instead of the more desirable assertive statement, it is full of text (no visual appeal), and if you were in that class you would also know this: all the information on that slide is in the textbook. It’s simply a repetition of material everyone has already covered. 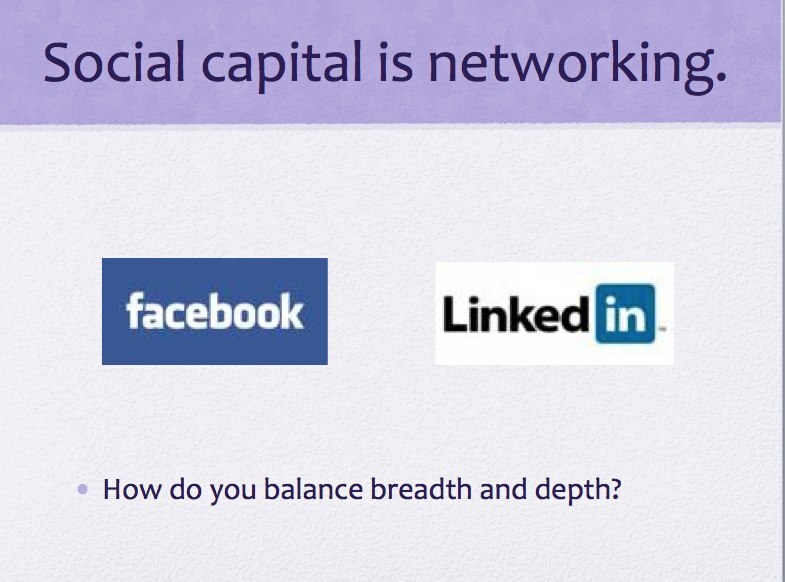 By contrast, the “good” example above provides illustrations that everyone can relate to; then during the presentation the presenter can verbally explain the social networking images using some of the textbook content that has been cut-and-pasted onto this bad slide. The sciences provide the best examples. Note the use of assertive statement + wonderful visual support on the slides here. #5 Plan to spend at least 2 minutes on each slide. If you have a 20 minute presentation, you cannot have more than 10 slides. You will run out of time if you have more!